This post is criminally late, but I had other things on my mind in January. My favorite games typically fall into one of two categories. First, I love games that drop me in the middle of a fully fleshed out world filled with great characters. This creates an opportunity for empathy I don't think you get in any other medium. Second, I love games that focus on giving me some tools and then asking increasingly difficult things from me. Tough platformers, tricky puzzle games, and twitchy FPS all fall into that second category. It's a rare game that combines both, but it does happen. Firewatch made the list because of empathy and world building. You're made to experience this story as Henry, not as yourself. It succeeded in that because of the voice acting, dialog, and fully realized world. It's not hard gameplay and your choices are basically limited to dialog options. But, it shows how awesome interactive storytelling can be. It's easy to be skeptical of The Witness. It reminds me most of those cheap puzzle books that feature a thousand Sudoku puzzles or word searches or cryptograms etc. In this game you take a simple puzzle made up of lines and dots and get to know it very well. But, The Witness grabs you because of how it teaches you. Eventually it teaches you a whole language that is so complicated it's hard to explain to the person sitting next to you. The way concepts are introduced and built upon reminds me of the best math teachers I had in school. Unfortunately, I got distracted 60% of the way through the game and I don't know how to get back in. I'm at a point where things are very complicated and I don't know how to relearn the rules without just starting over. The Dishonored series puts you in the shoes of an assassin but offers you the choice to never kill anyone. That premise is what got me interested in the first game. But what kept me was the excellent world building and gameplay. Sneaking around this new part of the world in Dishonored 2 is just as satisfying as in the first game. I'm doing a non-lethal ghost run, just like with Dishonored 1, which is harder but really rewarding. I haven't finished it yet, but I can say I spent more time playing the Clockwork Mansion level than I did entire games in 2016. It wasn't that it was hard and frustrating, it was that I liked it so much I wanted to perfect it. Hearthstone didn't come out in 2016 and it wasn't the first year I played it. But, I had stopped playing and the Whispers of the Old Gods expansion got me back in. 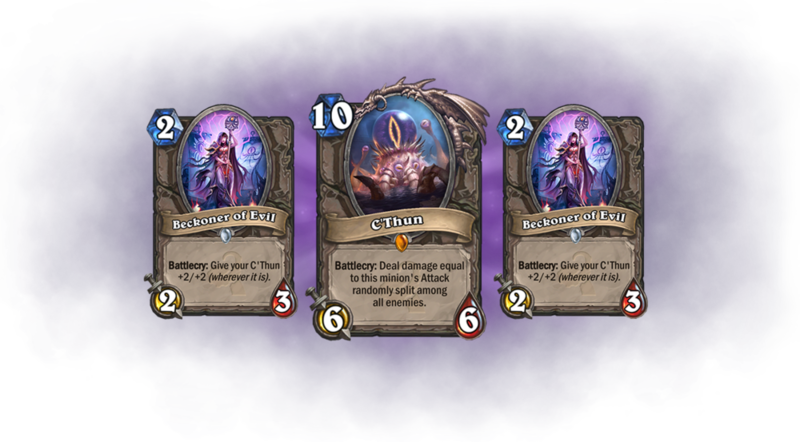 Whispers of the Old Gods introduced a new mode (standard format) that limited the available cards to the subset of recent releases. This limit meant that as a new player you didn't have to spend a long time collecting a ton of old cards, you could be competitive a lot sooner. This really did work. I rarely bought card packs before because the huge number of possible cards meant I'd get a lot of stuff I didn't want, it wasn't worth the cost. But with this expansion I spent around $30 right away, the most I ever have on a free to play game, because I got more value for it than before. The expansion also introduced the titular Old Gods which had complex card effects that you could build whole decks around. That novelty was plenty to get me interested again. INSIDE was originally on my main list. But, as I started to write about each game I realized that it didn't quite hit me as deeply as the other games. However, INSIDE was a game that pulled me in right away and kept me interested the entire time. It takes unexpected twists and turns and is very very creepy when played with all of the lights off. It's not very difficult or very long, so it's perfect if you're looking for something to play over a weekend.